Grapevine founder Gary Humble stands with B&F founder Paul Fountotos. Installed just days ago, the Grapevine Craft Brewery is now running what it says is a canning line that will revolutionize the craft brewing industry. 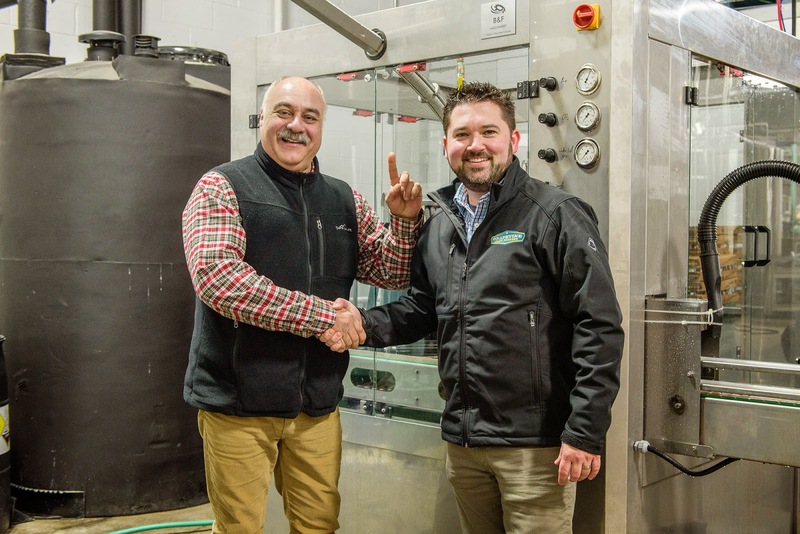 The first of its kind from B&F Machinery out of Montreal, Canada, the canning line is a rotary filler on a mono-block design with a 4' by 6' footprint. Made of 95% stainless steel, it is intended to supplant in-line fillers which have been traditionally more cost effective and therefore more likely to be implemented in a craft beer environment. As Grapevine owner Gary Humble explains, "There are problems with in-line filling and if money were no object, brewers would certainly opt for a rotary filler." new canning line on January 7, 2015. One issue with in-line fillers is that they have lower throughput compared to rotary fillers. 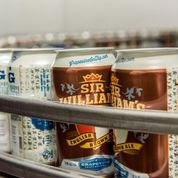 Grapevine's new canning line is currently processing over 60 CPM (cans-per-minute), but with a few tweaks both Humble and the B&F team (led by owner Paul Fountotos and partner Luc Bellemare) believe they'll be able to run 80 CPM within a few months. Another problem is that an in-line filler is an open-air system, and as any home or professional brewer knows, oxidation is an enemy of beer. Humble says that "you should always fill a can with beer using a CO2 pre-evac system and get the lid on the can as quick as you can" so as to reduce the amount of oxygen that comes into contact with the beer. With an in-line filler, this process "takes quite a bit of time," something that gets reduced significantly when using a rotary system. Coming in with "a price tag of...around $200,000," Humble believes "there is nothing on the market today that can rinse, fill, seam and run 80 CPM on a mono-block platform...at that price." After putting the product through its paces during an inaugural production run last week he says, "this thing runs like a dream" and "we could not be happier."